On Saturday the 7th of June, two rather large looming figures in the sport of boxing face each other in quite frankly, a very strange contest. Miguel Cotto has never fought at Middleweight and aside from a gimmie victory over the overmatched Delvin Rodriguez; he hasn’t beaten a live opponent since Antonio Margarito in 2011 losing to both Floyd Mayweather and Austin Trout in between. For Sergio Martinez he has had injury problems but has won his last 7 fights including dust ups with Paul Williams, Kelly Pavlik and Julio Cesar Jnr. Then again he found the floor against Martin Murray, a solid if somewhat limited fighter, eking out a tight decision in his home country of Argentina. For me, this fight really has only two options. Either Martinez wipes the floor with Cotto and wins an easy UD or he gets injured and has to quit. The interesting subplot for a long time was the negotiations before the fight. Revealed at the HBO face off with Max Kellerman, the problems stemmed from Martinez being treated as the B side despite being the champion. Both fighters tried to act above each other but you can tell that they fail to harbour any real animosity towards each other. Sergio must have had to step back and agree to the demands of Cotto because as he rightly said he is the A side in terms of reputation and financial pull. 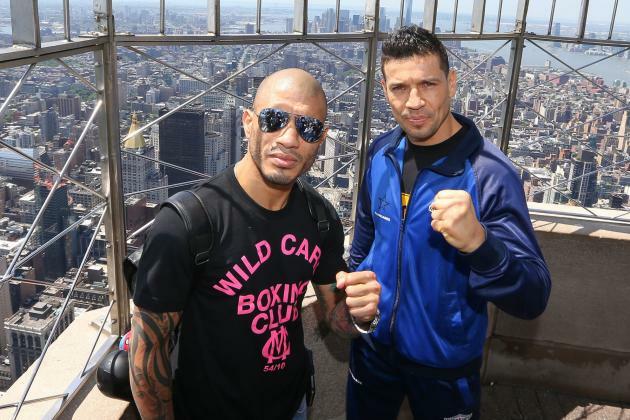 On the other hand, Sergio is the A side in terms of talent and Cotto is firmly the B side. I never quite got why Miguel Cotto was so highly rated and loved. Don’t get me wrong he seems like the antithesis of a lot of modern boxers in that he is articulate and respectful but his best victories come in very close fights against opponents I never thought were that good to start with. Beating guys like Antonio Margarito with a Pacquiao busted eye, Joshua Clottey or Shane Moseley never seemed like that big a deal. His performance against Floyd Mayweather was arguably his best effort in the ring but even that fight I thought he lost with a bit of room to spare. On the other hand Sergio Martinez is the total opposite to Cotto in many ways. He constantly moves, darts around the ring, throws unconventional punches and fully fit is a terrifying opponent for anyone to train and nail down. Part of me thinks that if the Martinez that fought Dzinziruk, Paul Williams or Kelly Pavlik turns up then he destroys Cotto. Miguel is too tough to get knocked out but we could easily see a stoppage if Martinez can do to him what Manny did, and frankly I think that is very likely. For all the Miguel Cotto fans out there (and there are many of them) then the one thing that you know can easily happen is the Martinez can get knocked down. Chavez nailed him in the 12th of their totally one-sided fight to that point and yet Sergio was the one dominating at the end. Martinez also was knocked to the ground with flash knockdowns against Paul Williams, Mathew Macklin, Martin Murray and Kelly Pavlik so Cotto should fancy his chances of getting a 10-8 round. Cotto will have to use his entire combination prowess coupled with his ability to mix it up to have any chance at all. He is very good at making fights a little dirty without going too far but will have to be extremely accurate when punching as Sergio can move very well for 12 rounds. Personally I think the biggest indicator of what is likely to happen was demonstrated in the Austin Trout vs. Cotto fight. Trout is languid, a little unconventional and a good mover. He took over the fight in the championship rounds and won a decision that no-one battered an eye lid at. Sergio I feel will do exactly the same, dance around Cotto for 12 rounds peppering him with long looping shots and either Cotto quits on his stool or loses a wide UD. Boxing fanatic, I love writing opinion pieces, fight reviews, previews and lists. Shane Mosley: “Ex-Wife”was married to another man!